The judge complimented everything about this stunning newly awarded Star Stallion. Malachi was 1st Premie and Champion Colt at his first Keuring in 2004 and was awarded with cheers from the audience "Star Stallion" in October of 2010. Malachi is 17hh tall, leggy and sporty with excellent dressage gaits.....I believe he is truly an example of what the Friesian breed has been desiring to produce. A performance build with correct gaits and a gentleman's spirit! 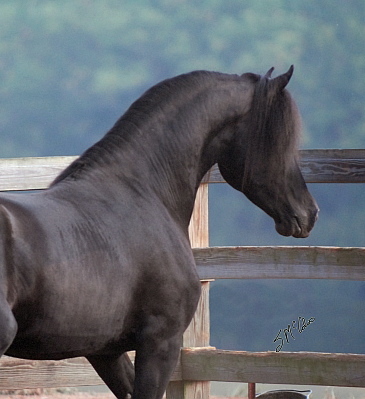 This is a talented young stallion that is a joy to ride.